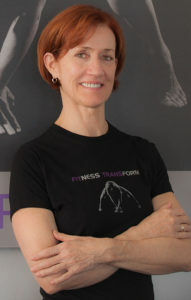 Mikki Reilly is the founder and owner of Fitness Transform Studio. Mikki graduated from UCSB in 2006 with degrees in Exercise and Health Science and Communication and has been a certified fitness trainer since 1992. As a competitive bodybuilder, she competed in the prestigious National Physique Committee (NPC) Excalibur and Iron Maiden Body Building Championships taking fourth place her first time out. The experience of having transformed her own fitness, gave her the expertise to help others to transform theirs. Mikki acquired the Certified Strength and Conditioning Specialist (CSCS) credential through the National Strength and Conditioning Association (NSCA) and earned the International Sports Sciences Association (ISSA) Distinguished Achievement Award, which signified placement in the top 1% of 15,000 certified trainers worldwide. As a presenter, Mikki has spoken on health and fitness at Santa Barbara Community College, California Health and Longevity Institute, World Presidents’ Organization, and Women’s Economic Ventures, among other venues. In January of 2007, Mikki was featured in C Magazine as one of the top ten body gurus of California. And in January of 2013, her book, Your Primal Body: The Paleo Way to Living Lean, Fit and Healthy at Any Age, was published by Da Capo Lifelong Books, a member of the Perseus Book Group. Veronica Champine recently graduated with highest honors from University of California, Santa Barbara where she earned a Bachelors of Arts in Psychology. Growing up as a competitive gymnast, pole vaulter and soccer player, Veronica loves all things health and fitness. With the help of an inspirational track and field coach, who showed her the benefits of kettlebell swings and a high protein diet, Veronica holds the Women’s Pole Vault record at her high school. As administrative assistant here at Fitness Transform, she brings the same passion and determination. 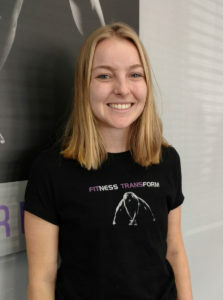 Veronica works to help our clients reach their fitness goals and believes that everyone has the potential to live the pain-free, healthy lifestyle they were born to have.